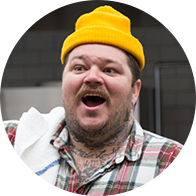 Get brand new Matty Matheson recipes shipped right to your door. No subscription necessary! WTF is a Meal Kit? Click below to start shopping with our partner Chef'd. Order as often as you want and don't worry about getting locked into a subscription. A recyclable box of pre-portioned ingredients is shipped to you in as little as 24 hours. FREE shipping on any order over $40! Check out a brand new How-To video for each recipe, order and cook them yourself, then share your #MUNCHIESMealKit with us. No flour, no mess, all chicken. A Matty favorite. Don't be scared of a little trout, greeen beans, and almonds. A stone-cold classic. Perfect warm or chilled. The best summer lunch, period. Good for dinner too. Make this for your hungover buddies. Vegan friendly, or not. Matty Matheson is the chef of Parts & Labour in Toronto, the host of VICELAND's Dead Set on Life, and the king of MUNCHIES How-To videos.